While it may not sound like too much, lay all this out on the floor and there are quite a few items to shuffle together. The pack that I have found arranges this set the best is the C.A.M.P. Rox Pack. Of all the crag packs I’ve used over the years, the simple design and strong materials have made this my favorite. 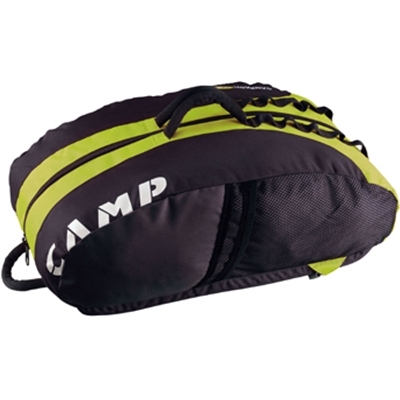 A full center zipper allows you to pull out from any section of the pack easily and doubles the Rox as a rope bucket. The roll-down top closure keeps moisture out, but allows you to load the pack up extra full if necessary. Two zipper pockets on the side carry valuables and headlamps, and the mesh pockets on the side can take 32-oz Nalgenes or an extra pair of shoes. Padded straps secure it to your torso and adjust easily to accommodate different layers of clothing. After three years, I still have the same pack that’s seen every type of conditions and is going strong. C.A.M.P. offers it in two volumes, so if your set-up looks a little different than mine, there are multiple options for sizing. Shop C.A.M.P on Outdoor Prolink. Not a member? Apply today! Mike Kimmel is an climbing freak. You will find him at the crag, in the gym, or anywhere he can climb.